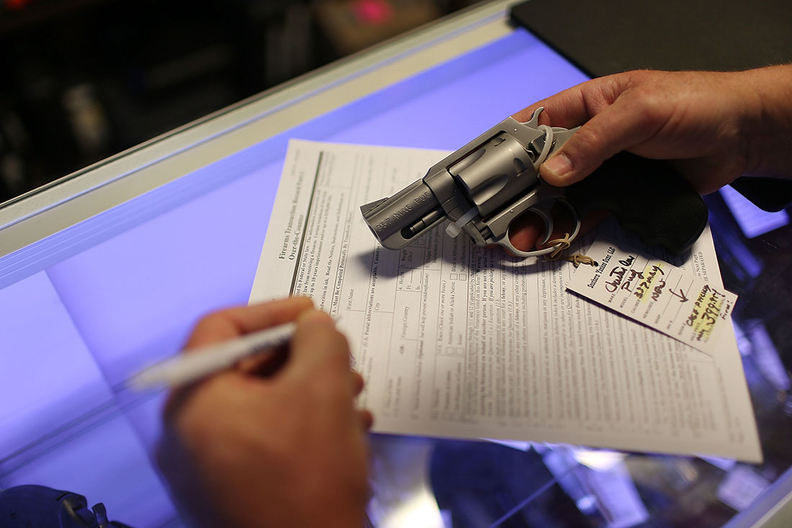 A Florida man fills out federal background check paperwork to buy a handgun on the day Obama announced executive action aimed at curbing gun violence. Kaiser Permanente is committing $2 million to launch its own research initiative to identify best practices for clinicians to help prevent injuries and death from gun violence, the health system said Monday. It is the first such investment for the Oakland, Calif.-based integrated health system. It's also the first major move by a non-academic hospital network to address the lack of gun violence research. The federal government pulled the bulk of funding for such research more than two decades ago, which has stymied support for the work. The effort will be overseen by Kaiser Permanente's new Task Force on Firearm Injury Prevention. The initiative will focus on developing better interventions within the care delivery setting to prevent gun injuries. It will take a similar approach to research on other leading causes of death, said Dr. Bechara Choucair, Kaiser Permanente's chief community health officer and co-leader of the task force. "We all know that gun violence is a leading cause of premature death in the United States," Choucair said. "We thought we could leverage what we do best to help us tackle this issue." Kaiser Permanente's eight regional research centers will conduct the studies and provide their findings to the public and other caregivers to foster a dialogue on evidence-based best practices. "We see this as a beginning of an opportunity to really address this problem comprehensively within our system and the communities we serve," said Dr. David Grossman, senior investigator at Kaiser Permanente's Washington Health Research Institute in Seattle and a co-leader of the task force. More than 30,000 people in the U.S. died from firearm-related injuries in 2016. Kaiser clinicians treated more than 11,000 gunshot victims in 2016 and 2017. The move comes as momentum to enact gun control measures has built since the Feb. 14 mass shooting at Marjory Stoneman Douglas High School in Parkland, Fla. So far, Congress has included language in last month's $1.3 trillion omnibus spending package to clarify that the Centers for Disease Control and Prevention can conduct research on gun violence, though the bill did not include funding specifically slated for that purpose. The delay in federal funding has prompted a number of healthcare stakeholders and states to raise money to conduct such work. The dearth of gun violence research over the past 20 years has left healthcare providers with few proven strategies and approaches to counsel their patients on how to minimize the risk of injury or death from firearms. Grossman said the initiative will seek to find ways to identify individuals who are at high risk to commit suicide, as they make up two-thirds of all firearm-related deaths. Researchers will also look at the connections between gun violence, mental illness and intimate partner violence.